Another incredible book to start off my reading year! Johann Hari's Lost Connections is subtitled Uncovering the real causes of depression -- and the unexpected solutions. I'd asked for it as a Christmas present, but before I had a chance to read it myself, it was co-opted by my beloved, who has been suffering from severe depression. It is a great recommendation that he not only read it cover to cover (concentration has been a problem) but found it helpful and persuasive. So what does make a difference? And how did we get here? 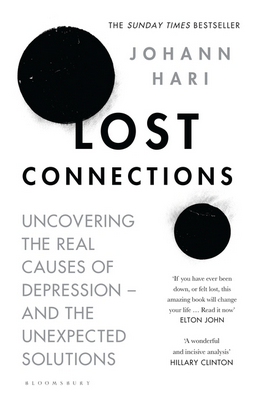 According to Hari (and I have to agree) we are really suffering from a lack of connection in our lives. This can be expressed in many ways -- lack of meaningful relationships, lack of meaningful work, lack of connection to nature. And the solutions, not surprisingly, involve reconnecting. This was a stimulating and engaging read, filled with lively personal anecdotes and enlightening information. It's extremely readable, and packed with food for thought. The only downside is that most of Hari's recommendations involve a radical reorganisation of the whole of society, though there are things a depressed individual can do to help themselves. But the most helpful thing would be a revolution in the way we live. Highly recommended.